Stay warm on the trail with super-compressible, down-effect insulation. A new insulating technology that provides a viable synthetic alternative to natural down. 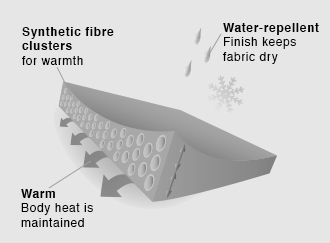 The innovative ThermoElite fill uses tiny spherical fluffy fibre clusters to simulate down construction, delivering comparable heat retention properties. Light, highly compressible and quick-drying for effortless efficiency in cold and wet conditions. Designed to keep your temperature regulated throughout changing climates, our ThermoElite technology will keep you warm on the trail when the temperatures drop.